Protecting movie assets is not the preserve of Hollywood studios. Independent filmmakers may have a long shot at the Oscars, but they require no less protection of their investment as the big boys do, as Chris Jones, independent producer and author of books on independent filmmaking, has found out. Copy protection is a crucial tool to help ensure that independent film producers receive the, albeit sometimes modest, monetary rewards for their efforts – helping them to enjoy some financial security while they pursue their next success and attempt to break into the big time. 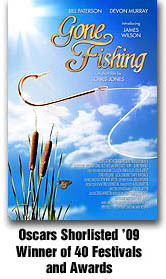 Gone Fishing, Jones’ latest film did not make it to the top five Oscars nominees, but got shortlisted to the last ten – a huge achievement in itself considering this film was made from donations as little as £50. He has no intention of allowing Gone Fishing to be pirated like its predecessor. Jones protected Gone Fishing with Fortium Technologies’ ‘Patronus’ copy protection software after the manufacturer’s marketing director, Peter Worrall, read Jones’ blog lamenting the propensity for illegal downloads and piracy. In the next dew days I will add to this perspective with an interesting look at how material is ‘re-used and remixed’, and ask, is this actually fair use or copyright infringement… The rabbit hole goes so much deeper! A guy I was speaking to said that he had Urban Ghost Story (a film I made) and really liked it. I asked which DVD release it was, and he said, neither, he had downloaded it illegally. Just plain came out and said it. I suggested he could now own his own legal copy and he seemed a little ‘stunned’ that I would be so direct with him. I didn’t push it. We all know piracy is going on, at an incredible scale too, but to own up to the film maker that they downloaded their film, and then be surprised when the film maker gently suggests they should buy a legal copy tells us a great deal about the state of things. People really do expect music and movies to be free. This leads us all into thinking, how can we better protect our work (or is it even possible)? Or more likely, how can we find new models that pay us to give the film away for free or nearly for free? Blimey. I got a lot of mails about this, generally discussing the problems from various angles, but all sympathising with the problem we face – how do we make our money back if there is no way to protect that investment? CHRIS RESPONDS - Sadly, the author of this comment declined to name themselves, which says a great deal. Of course I am delighted if people like my films, I just don't know what to say to unpaid investors, cast and crew about revenue that they should be seeing. And no he didn't buy a film, I suspect he will just find a download in due course. This is a very complex problem, and I am sad that you chose to stay anonymous. It only makes your words sound empty. So let’s hope he chooses to respond to this. Piracy has become a massive and controversial problem and is affecting our film and music industry. Seeing this from my point of view only and I'm open to being corrected. The trouble is the internet has changed everything! No one seems to know much about copyright rules, except where it applies to new films and music. Everywhere on the net infringements take place on you tube my space as examples.. This is creating huge grey areas that opens it up for crooks. People are already accustomed to having video recorders and can record and play back anything shown on TV Show their friends and family.. All recorders by nature break copyright. Should it be an unwritten rule that once sold to national TV then the public can record and watch it? As has always been the case? Should national TV pay extra then? If the public download something should they be blamed? Or is that down to the website acting illegally? None of this makes much sense. You could record in digital from the radio any track you want and yet this is legal? But not so if you download from the net? My instinct is the public should not be blamed but those who supply it simply because by blaming the public you alienate them and actually you cant stop them. At least not presently. The second thing is clear guidelines regarding older works that have been shown nationally should be drawn up that allows people to copy for their own use but not to download copies on a computer. The problem is many think well if I can record a copy from a recorder then why not from the net? The distinction being one person recording at home is a bit different to a download site flogging cheaply someones work. This needs to be highlighted boldly that its the same as buying stolen goods. At the moment the crooks are having a field day thanks to the muddled confusion and lack of clear rules. You can also read about just how Patronus works here… They also have a great copy protection PDF FAQ which you can read here . 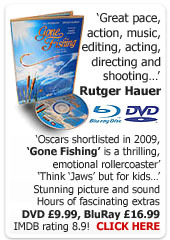 We are going to do a trail with the guys on some Gone Fishing DVD’s, to see just how it works. I will let you know our progress. A few other notes. Next week I am going to the Bahamas Film Festival and hope to bring you some video blogs. We are also playing in the Anchorage Film Festival and the Barbados Film Festival! And tonight, it's the British Independant Film Wards! Yeeehhhaaaaar!